The element is the point at which natural talent meets personal passion. This groundbreaking new book is all about how every one of us can find our element, connecting with our true talents and fulfilling our creative potential. Creativity expert Ken Robinson believes that we are all born with tremendous natural capacities, but that we lose touch with them as we spend more time in the world. Whether it's a child bored in class, an employee being misused or just someone who feels frustrated but can't quite explain why, too many people don't know what they are really capable of achieving.Education, business and society as a whole are losing out. 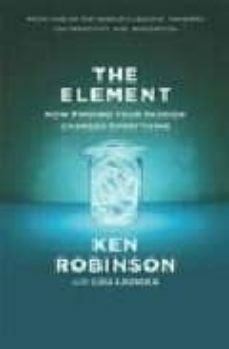 "The Element" draws on the stories of a wide range of people - from ex-Beatle Paul McCartney to renowned physicist Richard Feynman and many others, including business leaders and athletes - showing how all of them came to recognize their unique talents and were able to make a successful living doing what they love. With a wry sense of humour and a sense of optimism, Ken Robinson looks at the conditions that enable us to find ourselves in the element, and those that stifle that possibility. He shows that age and occupation are no barrier and he argues that there is an urgent need to enhance creativity and innovation by thinking differently about ourselves.